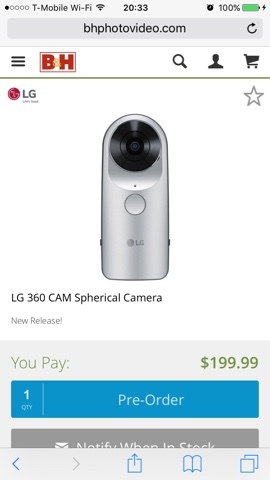 You can now preorder the LG 360 camera for just $200 from B&H Photo, making it the most affordable fully spherical 360 camera. The price is consistent with my predicted MSRP based on the recently-announced offer from T-Mobile. At this price, it would be almost half the cost of the popular Ricoh Theta S, with similar or better specs. Specifically, advantages over the Theta S include 2k video, 5.1 surround sound, and an expandable Micro SD card slot. It has two 13mp sensors, similar to the dual 12mp sensors of the Theta S, though the final resolution of the image is not yet known. The price undercuts the $400 Samsung Gear 360, which does have a higher video resolution. The Gear 360 also works only with certain Samsung smartphones. It is not yet known whether the LG 360 works only with certain LG phones or with any smartphone.